Spring has finally sprung! There are so many beautiful blooms in our neighborhood. All the yellow daffodils, white magnolias, purple hyacinths and pink cherry blossoms are all blooming at once. Spring is definitely my favorite season in Washington DC. 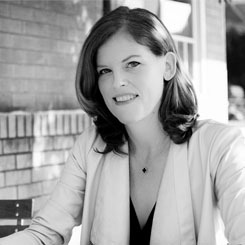 No humidity, perfect hair and no more heavy coats! 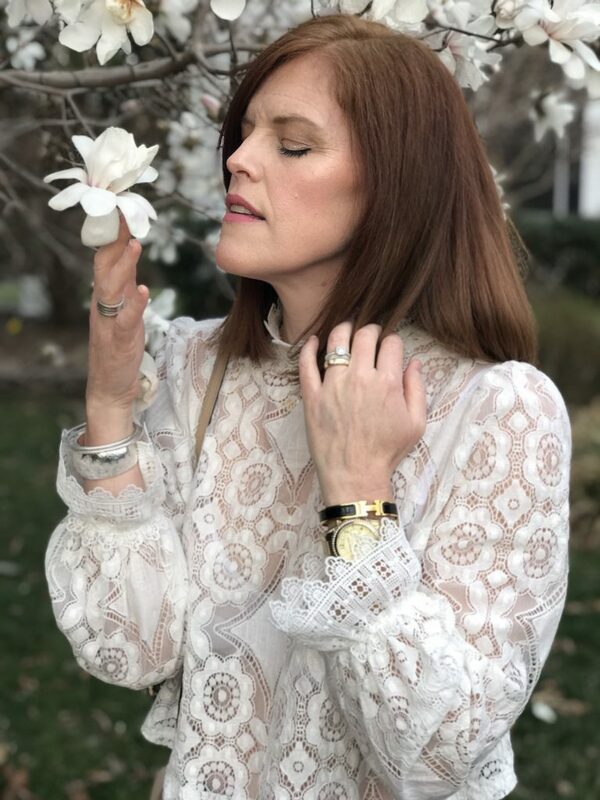 One of my favorite staple for spring is a white lace blouse. This pretty crop top featured here is from this year’s Zara spring and summer collection. I love the delicate floral pattern and long-sleeves details. It’s such a chic addition to any spring wardrobe. You can layer a camisole underneath or simply wear it as is to showcase the delicate lace. 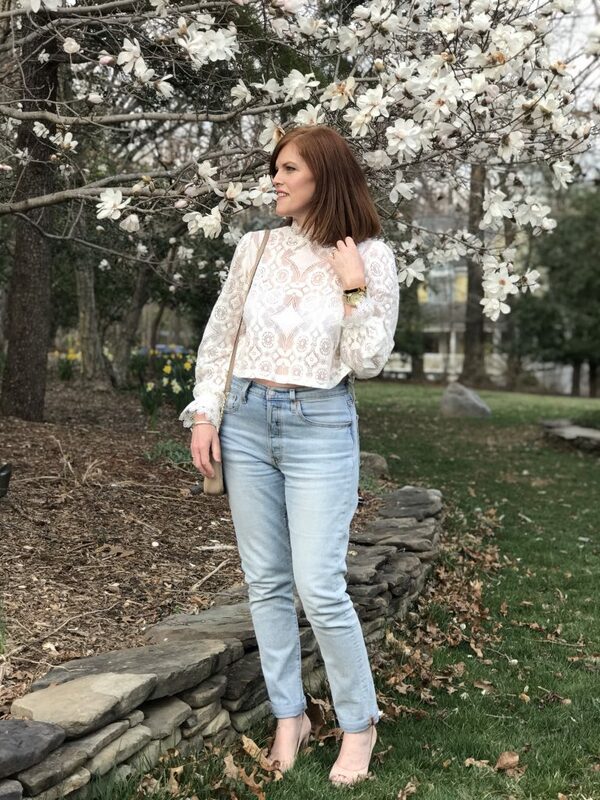 A lace top looks super chic with jeans and pumps. With all the pretty lace details, you want to keep the rest of your outfit fairly simple. 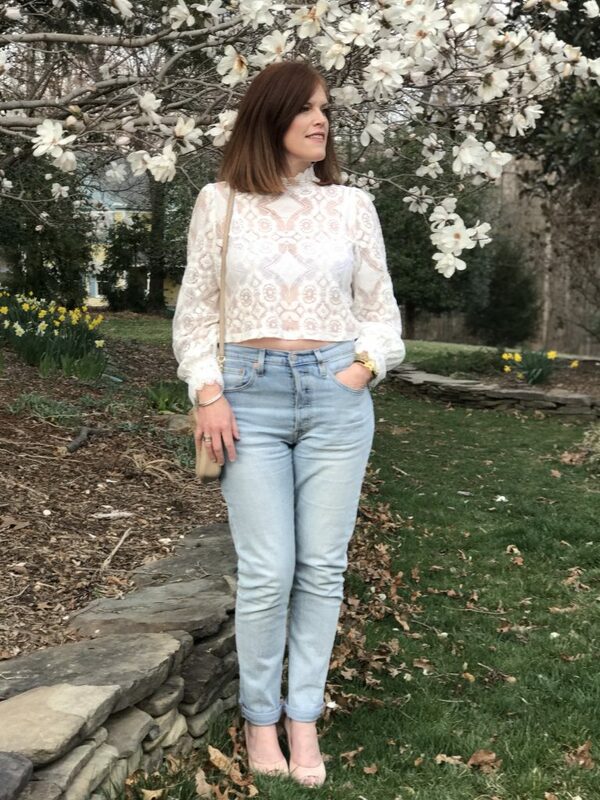 A lace top and jeans combination is actually one of my favorite go-to outfit for spring! This crop top works perfectly with a high-waist denim like the Levi’s 501 skinny jeans. Check out my last post to see a more casual take on this American classic denim, French Chic street style. 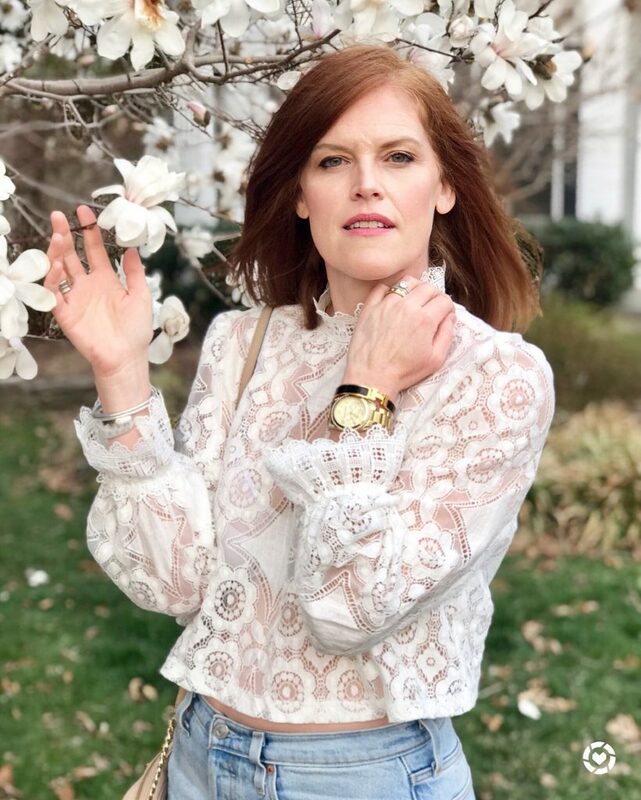 Hope you enjoyed this outfit and the first days of Spring! That is a beautiful blouse. I was on the hunt for a white lace dress, but havn’t found the perfect one yet! Have a great day! I just love lace for Spring! Thanks for stopping by Donna! Such a cute cropped top! Thanks Jennie! Have a great day! Coming over from Jess’s linkup. Just wanted to let you know how much I adore your lace blouse. It has such a romantic Victorian vibe to it. I love the Victorian details too! I linked a few other styles that you can shop. Thanks so much for stopping by! It’s so pretty! And this is the perfect location for pictures with this top! You look lovely in lace! I love an intricate textured white blouse, looks so good! 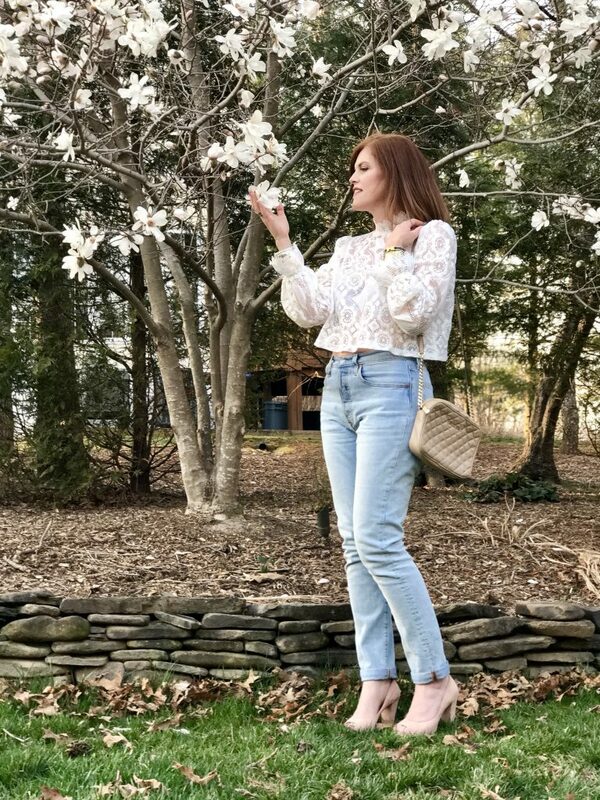 I especially love that you wore lighter jeans for Spring and love the flowers in your pictures! We missed seeing the cherry blosssom trees while visiting my bro a few years ago, as frost affected all the trees. 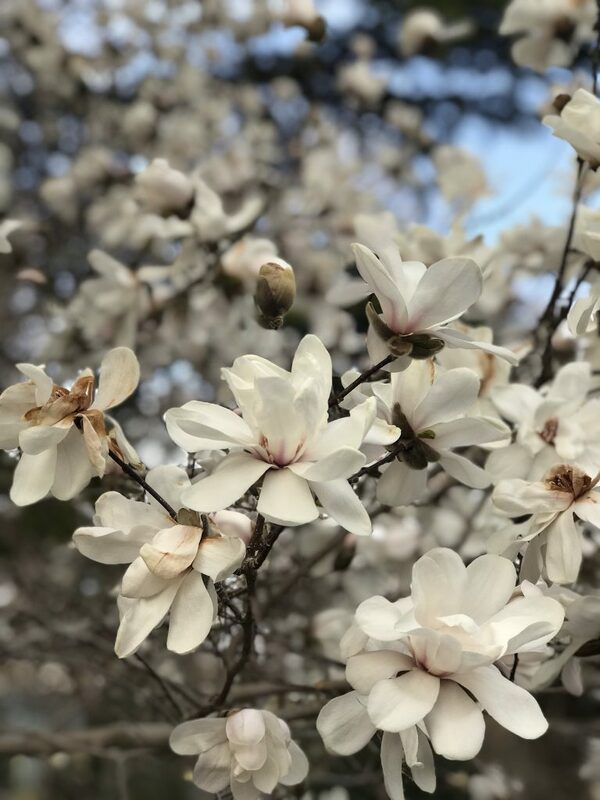 Spring blooms are so beautiful here in DC. Thanks so much for stopping by!